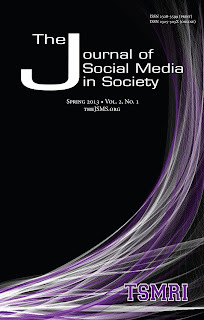 We welcome you to review the second issue of The Journal of Social Media in Society. We have been overwhelmed at the positive response and manuscript submission rate since launching the journal in the fall of 2012, and take it as an indicator of the relevance of a journal devoted to a phenomenon that has become a ubiquitous part of our personal and professional lives. The Journal is open to all research paradigms and disciplines conducting research and analysis on social media and mobile technologies. You’ll find our second issue to be no exception, with six articles representing the major social media platforms in the contexts of multiculturalism, inclusiveness, privacy, and communication theory. We are excited to have launched a new online process for manuscript submission and review via the Online Journal Systems’ software from the Public Knowledge Project. This software has streamlined processes for authors, reviewers, and the editorial team, and will allow manuscripts to be easily indexed and searched online. A big thank you goes to Tarleton State University for providing our editors OJS support and training. This case study places Lady Gaga’s “Bad Romance” music video in conversation with fan-created YouTube parodies. The author argues that the institutionally produced feminist rhetoric in Lady Gaga’s video is disciplined by fan parodies’ repressive vernacular, demonstrating the power of user-generated videos to contest progressive messages in mainstream culture. Because of the tremendous influence of the Millennial generation in terms of purchasing power and clout, understanding how they engage with organizations on popular social media sites, such as Facebook, is important. Millennials are more willing to “like” organizations in order to receive information, updates, discounts, or other benefits, but would “un-like” the organization if they wanted to dissolve the relationship or if they received too much communication. Men disclose more intimate topics with a recently added Facebook friend than women do in this study of more than 300 college students. Focus group research suggested that college students maintain and enjoy family relationships through Facebook, negotiating privacy issues as explored through the lens of Communication Privacy Management. Using the uses and gratifications approach, results of this analysis suggest the gratifications received on social network sites will vary dependent on the role of the communicator. Producing the second issue was an important step in further establishing an outlet for research of social media, and our thanks go to our editorial and review board members and patient authors who contributed to this effort. The Journal of Social Media in Society is a product of the Texas Social Media Research Institute, based at Tarleton State University, in Stephenville, Texas.